I am a teacher and I didn’t have to take that damn University of Wisconsin-required Shakespeare class. I’m teaching English in Thailand twice a week (so far). So far, I’ve only done a few basic lessons while introducing myself. I pass out photos of family and friends I brought from home while also teaching the kids words like sister, mother, father and friend. A large number of kids didn't have a teacher in their classroom so when they saw me, they ran out and went batty. One of the schools I teach at has an English teacher (who speaks very little English) and the other has none. The kids are fairly well-behaved, but full of giggles. I like to introduce my ability to speak Thai by saying (in Thai), “I can speak a little Thai. If you speak slowly, I can understand. If you speak fast, I will not understand.” I then say, “Hellohowareyou?” as fast as I can and ask them if they understand. They don’t. I then slowly speak, “Hello … how are you?” and ask if they understand. They do and they understand they have to do the same for me in Thai. More batty kids. Happy, but batty. I’ve never taught before. I’ve never even assisted a teacher. But I think I can help out here. I may even like it so much I’ll want to continue it in the states when I get back (I’m about a third of the way to an English teaching degree.) For now, I’m coming up with simple lessons for each week. This week I pretty much just introduced myself (age, marital status, where I’m from, hobbies), but I’m planning to teach body parts next week. I figured it’s an easy lesson to do since I can simply point to my knee and say, “knee.” Then I should be able to have the kids play games and have them point to the body parts I say. Without a teacher, this is what they were doing before I arrived. I asked them if it was fun and they said yes. Then I asked if they were sure it was fun and they said yes ... I think out of courtesy. Schools in Thailand are nothing like America. For one, there’s no insulation. Also, if a teacher does not show up, the class is not taught. There are no substitute teachers. When I arrived at my school today, three classrooms full of children spilled out to greet with spastic “hello!”‘s. When I asked them where the teacher was, they said they didn’t know. This is common. I have to admit, I like this. For twelve years of grade school, I longed for the day no teacher would show up and we wouldn’t have to learn long division, the table of elements or the story of the first white people to come to America. Finally I found a teacher, but not the one I’d talked to the week before who asked me to come back. When I told him I was there to teach English, he simply walked me to a room full of students and no teacher, pointed inside and walked away. I spent my first 30 seconds laughing at the craziness of the situation. I then did my best Mighty Mouse impersonation and entertained the kids, while teaching them English for the next hour. The teacher I'd talked to last week wasn't there. I told another teacher I came to teach English. He found a classroom without a teacher and said, "There you go," leaving me alone with these kids. The kids were watching some sort of lesson on the television. I asked them if it was fun. They said yes, but I think it was only out of courtesy. The Thai language has a few sounds that the English does not. They have many words that begin with “ng”. Not having these two consonants together in the English language, it’s not easy for me to speak them. I get my revenge every time I ask them to repeat my age. “I am thirty-three years old. Say ‘thirty three’.” The “th” sound is not in the Thai language, so I sometimes have to dodge the spit coming out of their mouths when they attempt this sound. The same happened at the school this morning. It sounds more like, “tirty-tree”. 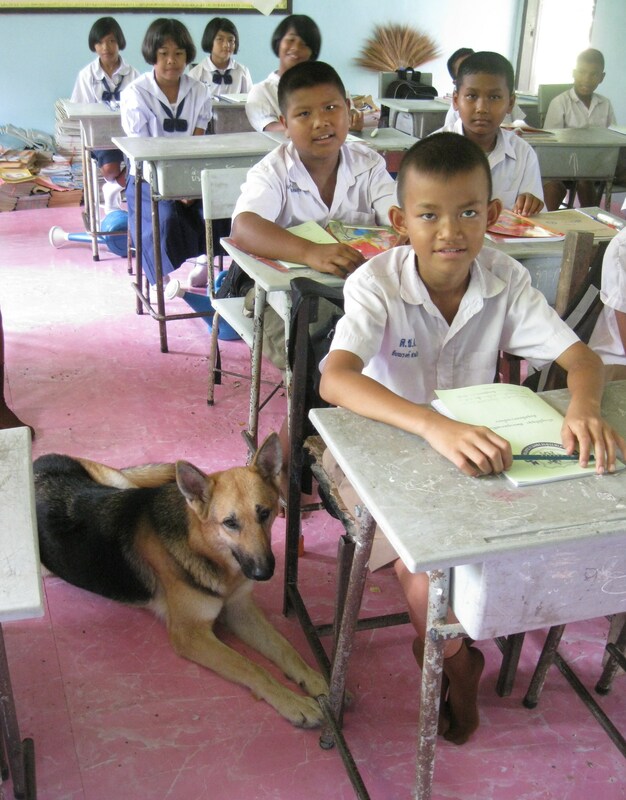 This dog roamed from classroom to classroom and chilled where he pleased. As of now, I’m teaching twice a week and two different schools. I’m looking forward to coming up with new lessons. I may even have a baseball lesson. This entry was posted in Peace Corps and tagged kirby puckett, schools, thailand by Jeff Jackson. Bookmark the permalink.